Our first step was to implement a Scrum framework. Since I’ve covered this in a previous blog post, I’ll skip the details, but basically, our system tracks estimated points, completed hours, and number of stories delivered by each team member in each area of our codebase. 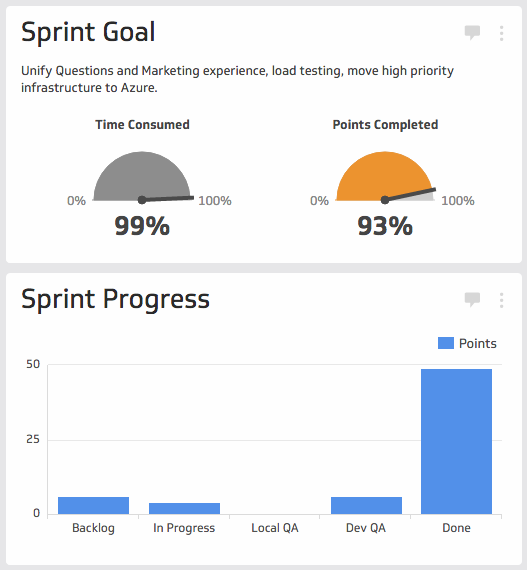 Once we got in the habit of tracking our points consistently, the next step was to build a basic summary of each sprint to review after it was complete. This would help us keep up with our average throughput and serve as a rough estimate of how well we did as a team in estimating and completing points. Here are some of the metrics we review after each sprint: The above chart tells us at a glance how productive each of us were and how evenly distributed our work was between job functions. A note about this review process: just because a team member has lower numbers doesn’t mean he or she performed especially poorly, so we have to take note of anomalies. For example, it’s reasonable that a developer got sidetracked by taking care of a number of hard to estimate bugs that came into the sprint late, and therefore didn’t get as many points as he normally would. Over time these sorts of events tend to even out, but it’s a good idea to record them anyway. 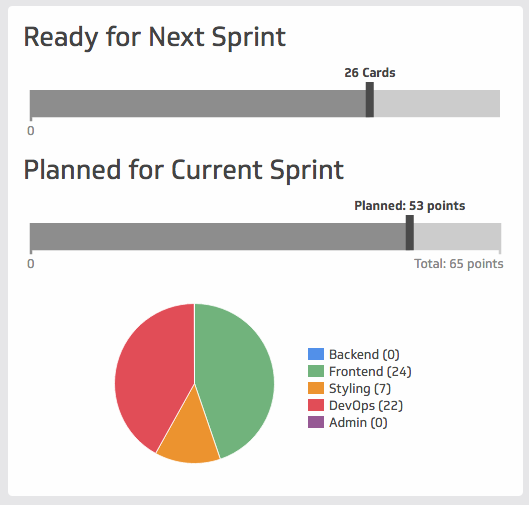 This chart shows us at a glance how many pieces of work are specced and designed for the next sprint as well as how evenly distributed work is for the current sprint. This helps us reduce planning bottlenecks as well as offers a visual indicator if the workload is out of balance (eg: too much work for the frontend devs, not enough for the backend). 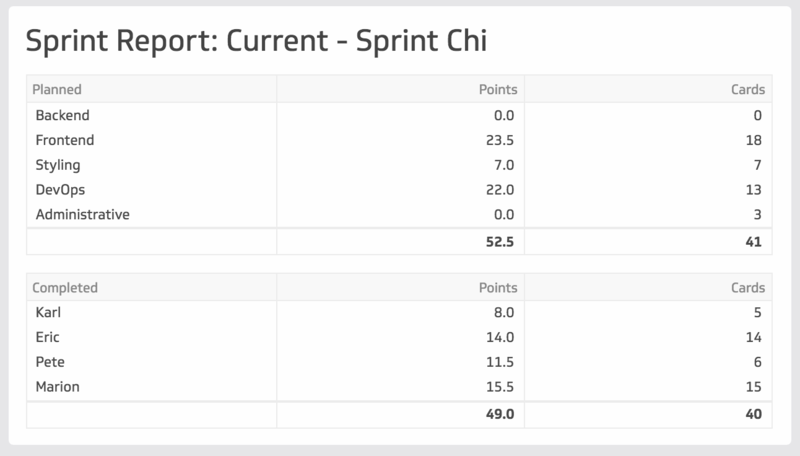 Next, we have a visual indicator of how close our sprint is to being finished and the percentage of points we’ve completed. There’s also a bar chart that shows where the work is distributed in the process. This helps us see if lots of items are stuck in QA or if we’re way behind our scheduled pace. 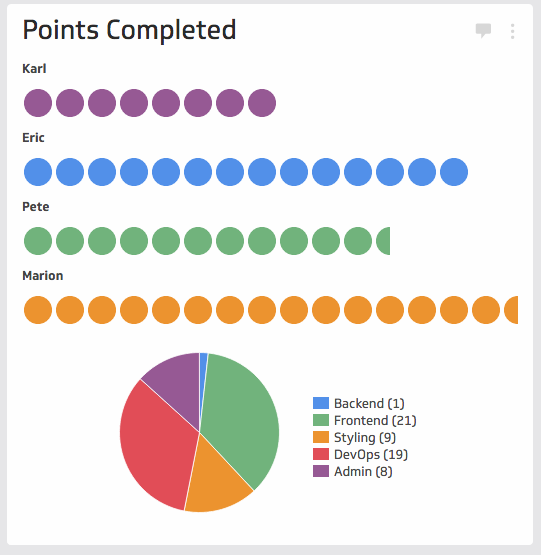 Finally, we have a chart that breaks down how much each team member has contributed to the sprint in progress and the type of work that has been completed (frontend, backend, etc.). While we don’t push competition between team members, I think it’s helpful to point to a metric like this when someone puts in extra effort and gets more done than we expect of them. Conversely, it could be a sign that we didn’t estimate points well. Either way, this chart makes it clearly visible where outliers are. Agile is all about continuous improvement, so even though we have a system that works today, we’re always looking to tighten it up based on the challenges we face. For example, I’ve recently seen more bugs work their way into sprints after they start, and our system doesn’t really credit bug fixes well. I’ll be working on a way to improve that in the next iteration. Another issue we are constantly aware of is that estimates are never a perfect metric in themselves. We don’t always get them right, so sometimes people get more or fewer points than they deserved. We’ll eventually figure out a way to improve this and we may bake it into our tracking system down the road. I hope this is helpful to other small organizations implementing Agile and sprint tracking. If you have questions, your own tips, or whatever else, let me hear about it on Twitter.